I find it rather sad that we rarely use envelopes anymore, but in a way I guess that makes them special. The party and wedding industry sure have come up with lots of fun shapes, colors and sizes. And of course, artists will be artists, coming up with off-the-wall uses for envelopes. Here’s mine. Back in the day, when letter-writing was more common, my father received a hand-written letter from his mother every week. She always tucked a coin envelope inside with a nickel or a dime for me! I’m pretty sure this was the first money of my own, and my father instructed me to save it – a lesson in fiscal responsibility! But I digress. 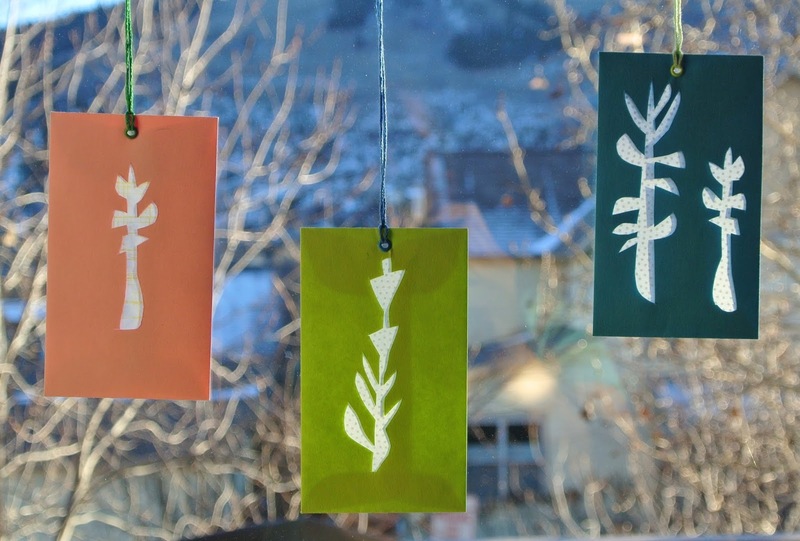 Here’s a way to turn a simple coin envelope into a light catcher using Rae Missigman's Pickleweed Mini Stencil (or any other small stencil pattern). Try it with larger envelopes and patterns too! I purchased an assorted set of coin envelopes from Jam Paper & Envelope. Due to the size of these envelopes, I traced one or two of the plant forms onto each envelope. Have an eraser on hand to remove your pencil marks. With the envelope flap closed, cut out the stencil design with a cutting knife to create a window through all layers. Use the envelope as a pocket and slip a sheet of translucent decorative paper inside (I used terassen paper from Washi Arts, which comes in several patterns). Seal the envelope. I set a mini colored eyelet in the top center of the envelope for hanging. Hang your creation in a window and enjoy the way it catches the light, or use it as a fun and unique gift tag. For more illuminating paper ideas from Helen Hiebert, check out her Twelve Months of Paper How-To Book & Calendar. Helen also writes a weekly blog called The Sunday Paper, which is full of paper inspiration: https://helenhiebertstudio.com/blog. Visit her website to learn more about her workshops, online classes and artwork: https://helenhiebertstudio.com.